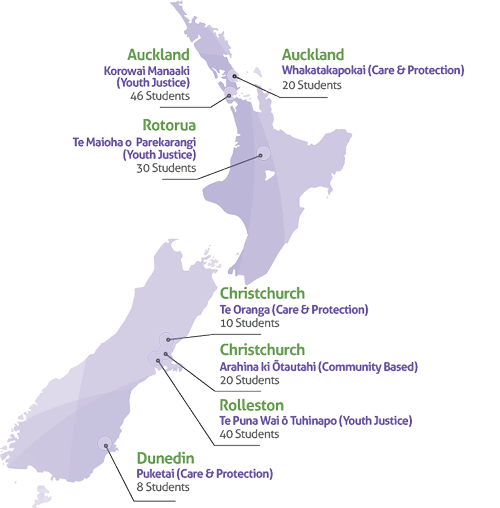 We provide vulnerable kiwi kids with a learning sanctuary. At Kingslea School our students feel confident, feel they belong, enjoy coming to school, have a voice in what goes on for them, feel challenged at school and feel proud of the things they have learned and achieved. Kingslea is not like any other school in New Zealand. We are a special, composite, decile one, state school delivering education to children and young people within residential and also non-residential care throughout New Zealand. Our teachers and students belong and are connected within a multi-site, nationwide school. Kingslea is a sanctuary specifically geared toward continuous learning, where students can rediscover the magic of learning and achieve their potential. All our students fit the Ministry of Education profile for priority learners and come to us for Care and Protection and/or Youth Justice related issues. Our classroom dynamics can change daily and students can be with us for anywhere between two days and two years. Copyright © 2017 Kingslea School. All rights reserved.